The World's First! * 3-Dimensional form fits perfectly to your baby's body frame! New curvy form that matches your baby's round body frame! Tightening around the babies waist and legs has been reduced by about 50%!★Wraps very gently! 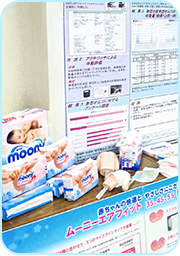 ★2 There are individual differences depending on the baby's body and how the diapers are put on. 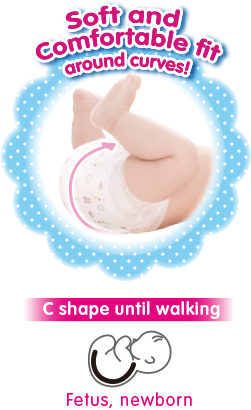 *1 The stretch sheets around the waist and crotch along with the uniquely cut shape of the absorber help to fit around the baby's body. Prevents leakage even from runny stools! New Technology - Wavy stretchable gather! and is gentle to the skin! 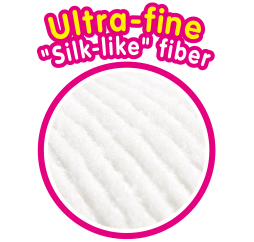 Air silky - gentle to the skin! and helps to prevent rashes. *The line changes blue-green after urination. A babies' weight changes most dramatically, during the newborn to S size phase. There has been an increase in the ratio of babies born small. 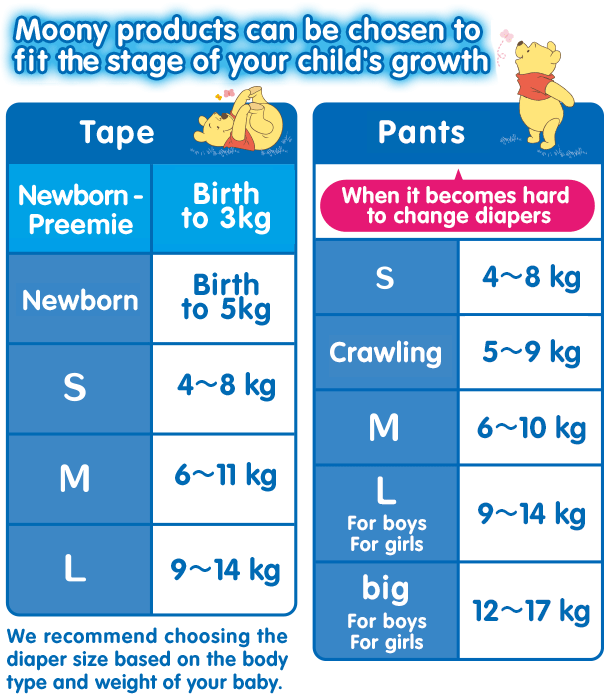 When considering the weight of babies over 3kg at time of hospital discharge as "100"
Proper fitting diapers should feel more comfortable for babies, too. 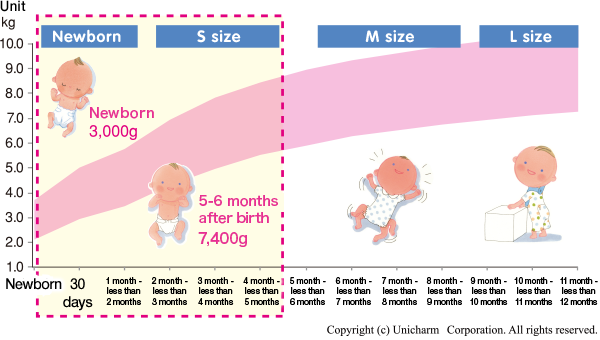 Newborn - Small (birth to 3kg) and Newborn (birth to 5kg). 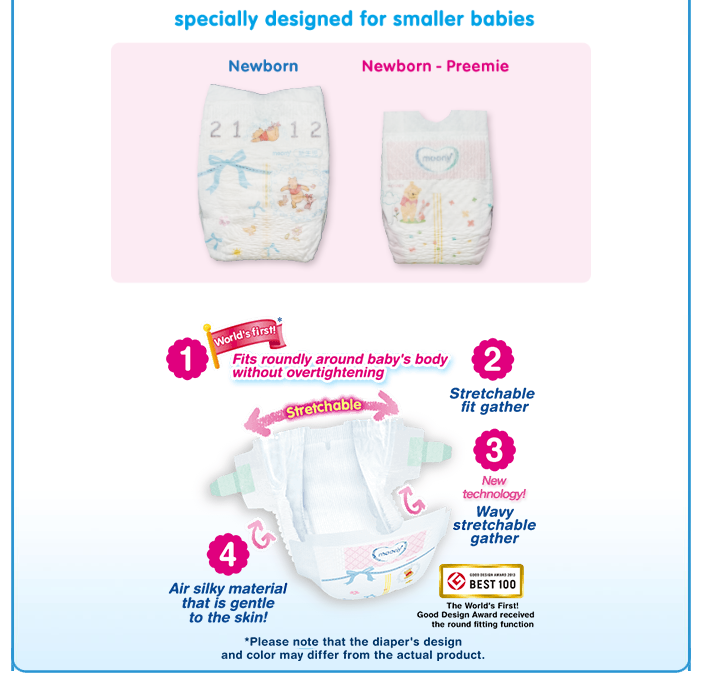 Unicharm carries out professional research on the form and top sheet functions of diapers. Unicharm has conducted extensive research and has announced that their new diapers developed to fit the body size and skin (i.e. 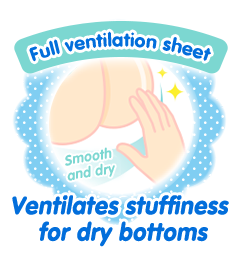 material that is gentle to the skin) of premature babies can reduce the stress of urination and defecation. The research was carried out in collaboration with the Japan Association of Research on Developmental Care. 1. 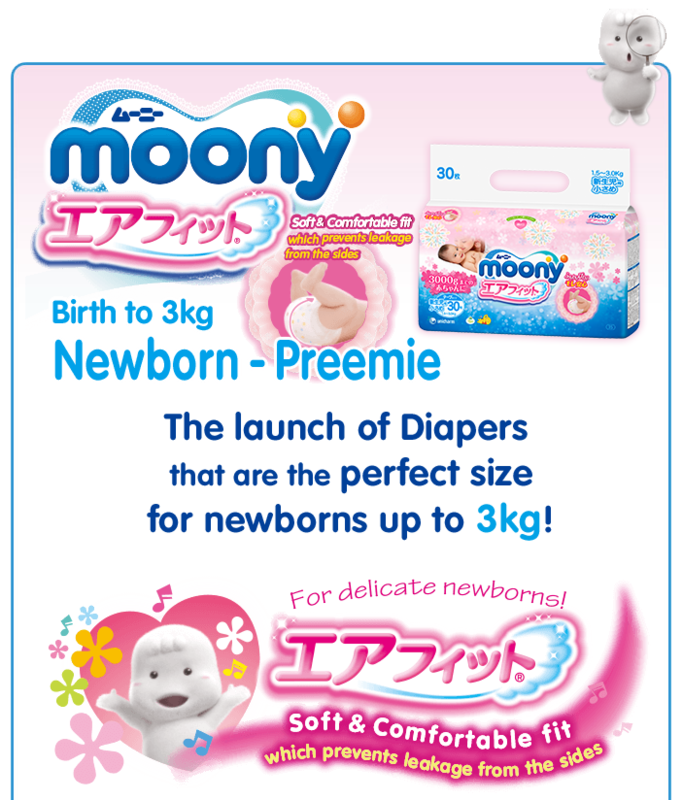 It was found that there is a high likelihood that Moony Newborn - Preemie, which was developed to be suitable for the body size and skin (i.e. material that is gentle to the skin) of premature babies can reduce their stress of urination and defecation. - The side with the tape is "The backside"
The entire backside of the diaper stretches which prevents you from worrying about the diaper being too tight for your baby.